HCG India program is a complete package to lose 8-10 KG of weight within a month. The HCG kit contains the purest form of homeopathic HCG+Amino Acids, Program and Diet Manual to walk you through the whole easy to follow program, Recipe book with delicious diet recipes and Free Herbal slimming tea. Easy to follow & Practical program. Built for Indian food and lifestyle scenario. Veg and Non-Veg diet options. Delicious food options with calculated calories. High energy levels and no starving. No crash dieting, magical diet drops. Lose upto 0.5 KG weight daily. HCG India congratulates you on chosing the proven best and helthiest way of losing weight. All the best. Lose upto 10 KG fat based weight every month at home through our revolutionary pure homeopathic HCG drops and our scientific diet protocol customised for Indian scenario. 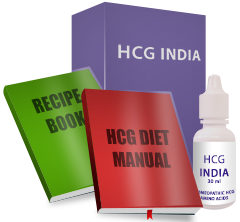 HCG INDIA is a complete program where we provide medical & diet support by qualified doctors. We make sure your experience is great with the program. 100% Safe, No side effects. Quick & healthy weight loss. Lose weight & don't gain back. No Exercise, No Surgery, No Machines & No crash diets required. A/c Name: Eulogik, A/c No. : 005505500143, ICICI Bank, Bhopal Branch. IFSC: ICIC0000055. I never assumed HCG diet experience would be this much fun. I lost 18.5 KG (I was about 80 KG.) and my appetite is back to normal. I feel great and have much more energy. I also get better sleep. I lost 11 KG in just 30 days. With my lifestyle, it never seemed I could lose weight so easily. Thanks HCG India for the awesome support. I tried almost everything before HCG India which either didn't work or were impossible to follow. I loved the easy to follow program and it made me lose 25 KG of weight in just 3 months. Thank you for changing my life. All online offers and prices are valid for online purchases only, and may be different from those in the catalog and in our retail stores.